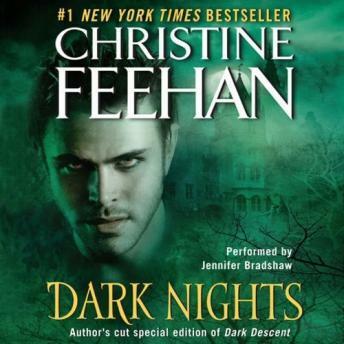 #1 New York Times bestselling author Christine Feehan is arguably paranormal romance's premier practitioner, critically acclaimed and widely beloved for her 'Dark' novels, featuring the mesmerizing race of powerful, tormented immortals, the Carpathians. Dark Nights is a special gift to her many loyal fans: a newly expanded and reimagined version of her classic novella, Dark Descent—100 pages longer than the original—combined with her breathtaking and unforgettable short story, Dark Dream. Aaaaaa. This was a pleasure to listen to. I loved the story and was thrilled at the extended version. However, I was disappointed at the narration. While Ms Bradshaw has a pleasant voice, the curious mispronunciations of common words was distracting. Traian's accent was overdone and the bizarre drawing out of his words was irritating and distracting. Would he have such a heavy slow dracuula (Romanian) accent after spending so much time in India, Sri Lanka and other countries for centuries and an Italian upbringing? I confess I thought Traian was the italian version of Trajan and pronounced "Try'-yan" so I was confused by the line early on about his name being like Train (choo choo). However, Bradshaw's portrayal of Jubal was excellent and had me thinking about Jubal in other books. I've read nearly every book of Feehan and would have to rank Joy and Traian's story up in the top 5. Fun Premise, great adventure, strong female, awesome appreciative "medieval" guy, interesting supporting cast and of course, key hints and clues in the cave to the long unfolding story. Thanks Ms Feehan!